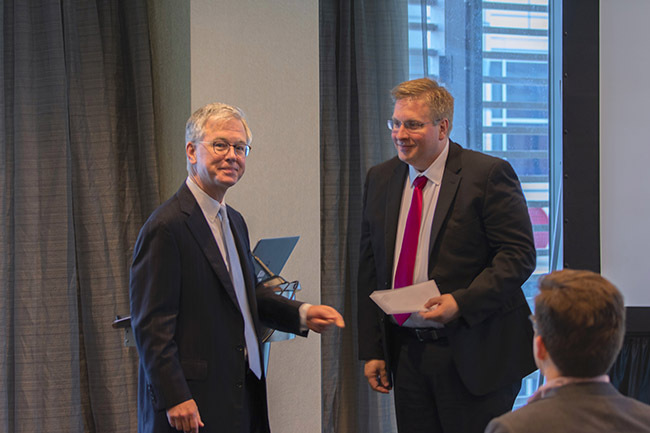 Bruce McDonald, left, presents a gift to University of Houston Law Center Professor Darren Bush, right, at the State Bar of Texas Annual Meeting. June 22, 2018 - Clinical programs at the University of Houston Law Center received a $3,500 gift Thursday from the State Bar of Texas' Antitrust and Business Litigation Section. Professor Darren Bush, the Leonard B. Rosenberg College Professor Law, accepted the pledge during the State Bar of Texas Annual Meeting at the Marriot Marquis in downtown Houston. "It is the practice of our section annually to make a donation to the pro bono program of a law school located in the city in which the state bar's annual meeting will be held," said Bruce McDonald, a partner at Jones Day. "It is our way of engaging in pro bono – given that there is not much need for pro bono antitrust work." "The clinical programs at the Law Center thank the Texas Bar's Antitrust and Business Litigation Section for its generosity," added Associate Professor Janet Heppard, Director of the Clinical Legal Education Program. "We will put this donation to good use helping our clients."